It has been exactly 21 days since we left S kardu and we have actually achieved quite a lot. Sergey, Rene, Simba and I have spent 3 nights on broad peak. The first night we were at the tiny site of Camp 1 at 5,300m and the following two nights at Camp 2 at 6,120m. It has been quite interesting climbing a big hill in the summer as the temperatures are much milder and hardly get below zero – even above 6,000m. However, it could also have to do with the heat wave that is currently spreading through large parts of Asia – and even Europe as I hear. 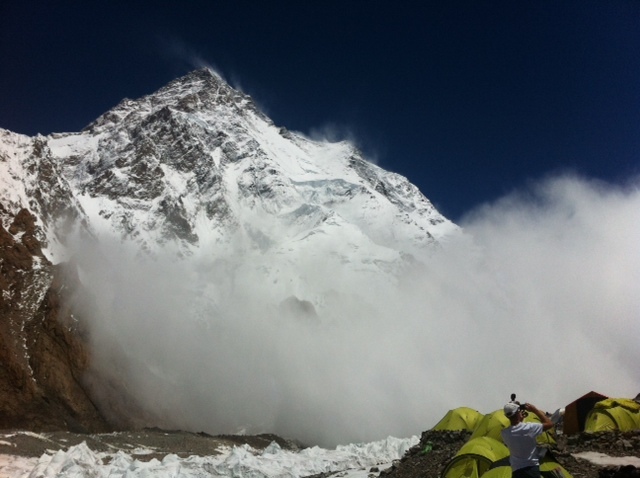 I am now back at K2 base camp to rest for a few days before I go back up the hill and stay one or two nights at Camp 3, which will probably be between 7,000 and 7,300m to acclimatise and weather permitting I am hoping to attempt for the summit at the end of July. So far I have been feeling good and strong with only the heat being a bit debilitating. Over the past few days many expeditions have arrived at both K2 and Broad Peak and I had the pleasure to meet some old friends, such as Ivan Vallejo from Ecuador or Tunc Findik from Turkey. I guess this is what I love about my job with Miss Elizabeth Hawley – I know so many people and it is always good to bump into them. I will try and send another update once I come back from camp 3 but in the meantime you can always checkwww.himex.com. Thanks for following me on this website or in twitter. Hope you a safe ascent. Grias di Billy, I wish you`reach the summit of Broad Peak and valley below later. If you find some nice stones on your way down, pickÂ´em up and bring them home,if they`re not to big and heavy. Gutes Wetter und viel Spass. Robby. Wish you the best weather, take care dear. Ohmann Billi, wie groÃŸartig!!! Have so much fun and be careful!!!!! !